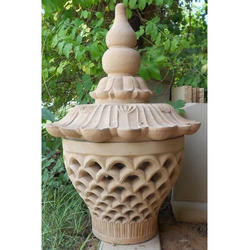 Offering you a complete choice of products which include garden stone lamps. As per the varied necessities of valued client, we are providing a beautiful collection of Garden Stone Lamps to the customers. These lamps can be placed anywhere in building such as corners, hanged on walls, garden area, walkway side and main entrance gate to add a royal aesthetic touch to your interior or exterior. The look of the garden is enhanced by the use of these lamps. These lamps are break resistant in nature.